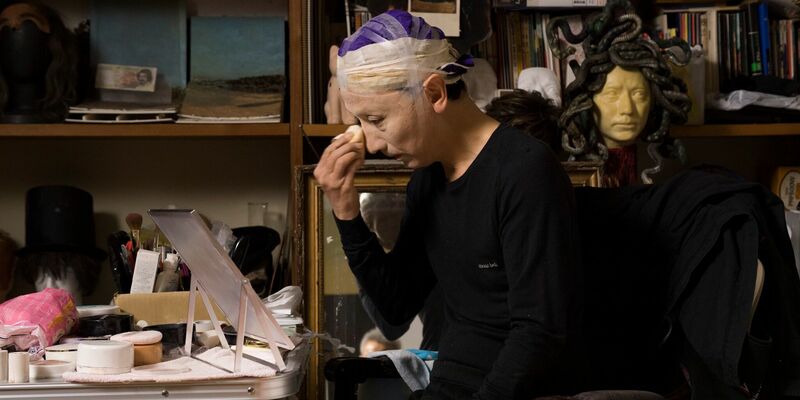 Yasumasa Morimura, Egó Obscura, 2018, color, sound, 51 minutes. Photo courtesy of the artist. For over thirty years, Yasumasa Morimura has been practicing tactics of appropriation to enact embodied challengesone might say glitchesto the canon of Western art history. “Ego Obscura,” which runs until January 13, 2019 at the Japan Society, marks Morimura’s first institutional solo exhibition in New York City. I FIRST STARTED making self-portraits in 1985, using prosthetics, cosmetics, and sets to assume the roles of figures who signify more than themselvesindividuals or works that have become archetypes, including old masters’ paintings, Albrecht Dürer’s Self-Portrait, Leonardo da Vinci’s Mona Lisa, Édouard Manet’s Olympia, Andy Warhol, Marilyn Monroe, and Michael Jackson, to name a few. I am aware of and worried about how many young people are becoming more conservative in Japan, and the fascist voices there are also getting louder and louder. This concern is very much present in my pieces in this exhibition. In the past, I’ve also embodied political figures like Vladimir Lenin and the Japanese writer Yukio Mishima, who saw the affluence and commercialization of postwar Japan, as well as the radical-leftist student protests of 1968, as signs of the country’s military and cultural castration. In what is a well-known incident in Japan, in 1970, Mishima staged a failed coup to reinstate the Japanese emperor, using a sword to commit suicide shortly thereafter. There’s this place in Tokyo, in the Shinjuku area, called Robot Restaurant that’s popular among foreigners and the Japanesethey go there to get served by robots. Asian technology, or techno-culture, attracts a lot of Western and non-Asian audiences; technology, or techno-pop, is also one of the Japanese government’s mainstream means of promoting cultural tourism. This idea of “technological Asia” is suddenly one of the big movements in the world. If we watch Western movies with techno-futurist visions, they often employ Asian bodies to portray robots, to serve as a kind of buffer between present and future, white and black, male and female. What does it mean to be Japanese? What does this identity mean in this world? Roland Barthes said to go to the city center of Tokyo is to encounter a kind of social truth, to participate in the proud plenitude of so-called reality. Tokyo offers this precious paradox: it does possess a center, but the center is empty. What does any identitynational, racial, sexualmean? Who are you as a cultural body, as a person in this borderless time?